Loafers are a really interesting type of shoe to me. Let’s face it: traditionally, they kind of come across as an old man’s shoe. I mean, loafers? Seriously? Total grandpa shoe just ready to be paired with a sweater vest. One thing I love about style and blogging, though, is that it gives you different inspiration, and the ability to change your mind. (Case in point: I recently found an old fashion magazine whom I will not name that had a 2010 spread on flared jeans. Their takeaway? Do not EVER wear cropped flares. And look at us now, ladies). ANYWHO, I must admit I’m kind of digging loafers these days. 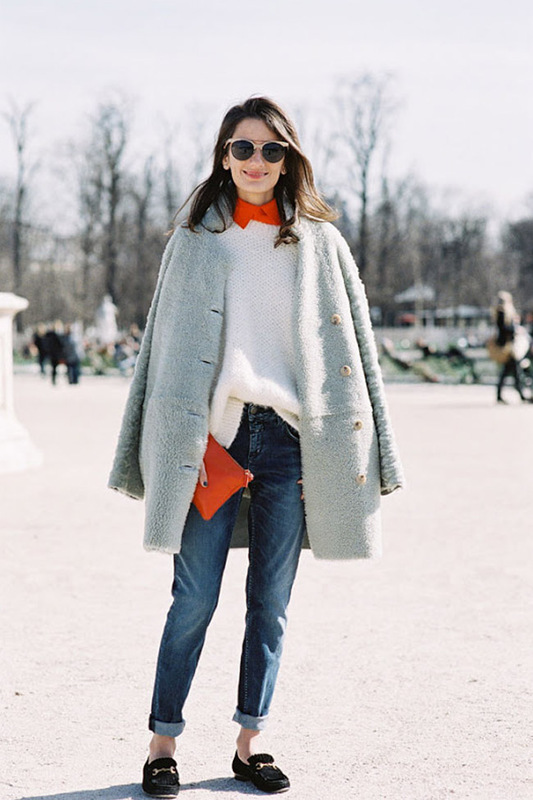 As I see more inspiration in how to wear loafers, I become more convinced they’re the perfect shoe to transition your looks seamlessly to spring. Here are five ways to style loafers for this coming spring. You just can’t go wrong with a timeless denim look. Loafers are great because they can add a little sophistication to a casual outfit. Plus, they feel spring like while still actually covering your feet. In this look, I love the soft layers and textures paired with a fun pop of color and a slightly more masculine shoe. It’s really the perfect combination, and so easy to pull off if you’re having one of those “stare at your clothes for 20 minutes thinking you have nothing to wear” days. 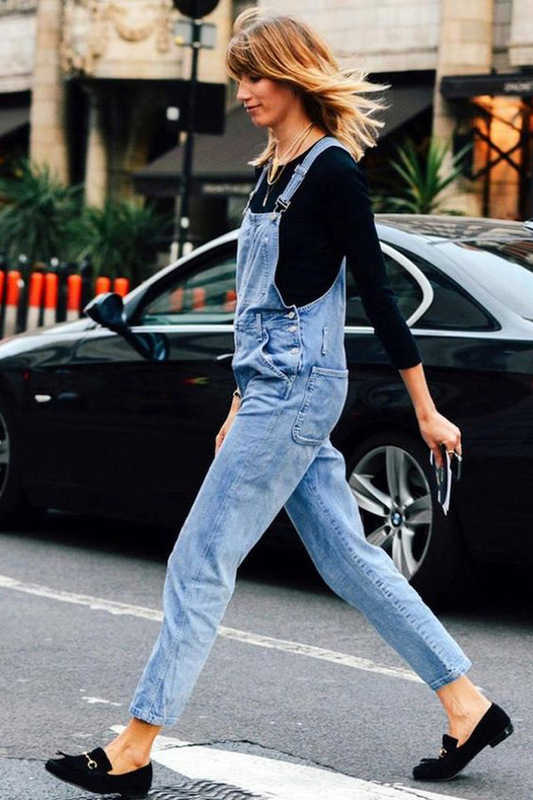 Pairing your loafers with overalls is a great way to keep it simple and classic while still doing something different than regular jeans. The structured look of loafers is the perfect balance to trendy overalls. It’s a look that could work for those last glimpses of winter-like weather (with a few added layers), but is also perfect for spring. Try styling your loafers with a long shirt dress (a kimono would be a great option, too). 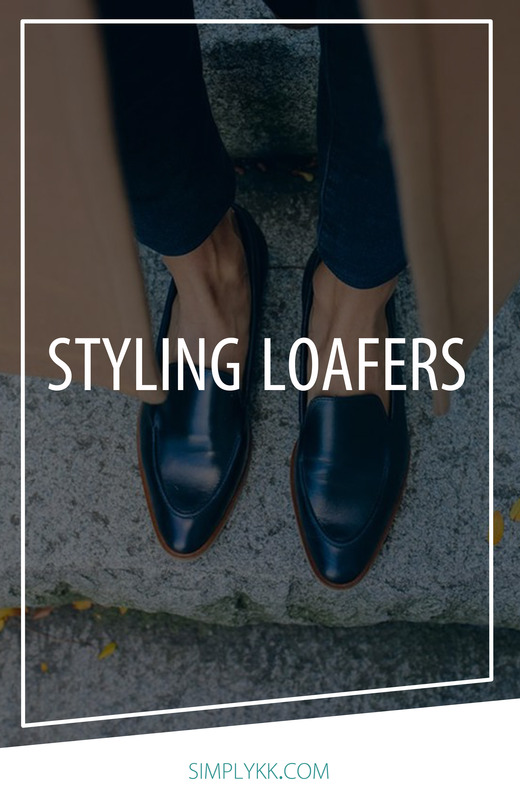 Again, loafers have such a timeless look, and are so versatile – you really have a lot of room to try new looks with them. As seems to be the theme with styling loafers, it’s their structure that provides such a great juxtaposition when paired with an opposite. In this case – a subtly girly, perfectly layered spring shirt dress. Side note: surprise surprise it’s more olive green! A huge positive to wearing loafers is that they look timeless. Because of this, they are the perfect shoe to pair with a statement piece or statement outfit. Loafers polish off the look without being distracting, and allow the statement pieces to shine. 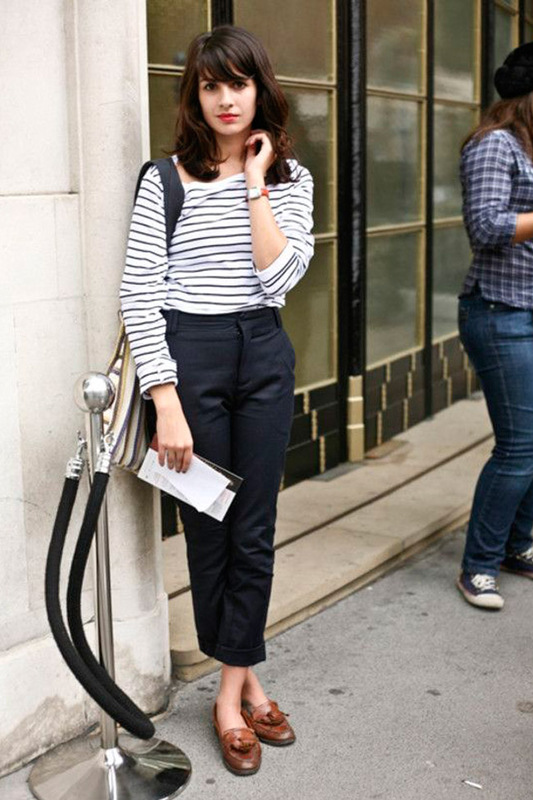 I love the idea of wearing loafers for work (I’ve also already covered my love of stripes so I’ll spare you today). They feel professional without being stiff, and look so chic with a slightly cropped pant. Finding the right work shoes in this transitional season no longer has to be complicated. Loafers are sturdier than a lot of flats (perfect for those spring showers… no one wants wet feet at work) and more comfortable than a lot of heels (score). One last thing… Just in case you missed it here, I now offer the option to subscribe via email to Simply KK. Check it out at the bottom of the page if you’re interested in keeping up with posts weekly. Right now, it’s just in the stages of being a recap on blog posts (so you can click through to read the ones that interest you most) with the goal of eventually transforming into a newsletter with additional content. I’d love to have you join!